Today, with the help of community donors and partner organisations, Market Forces published a full-page advertisement in the Financial Times Asia, urging Standard Chartered Bank to stop funding new coal-fired power plants. Copies of the newspaper were handed out to Standard Chartered staff at their office in Singapore, a country of prominence and focus for the bank. Market Forces get ready to hand out free copies of the Financial Times Asia to Standard Chartered employees in Singapore, 23rd August 2018. A crowdfunder for the ad raised an incredible A$10,225 from donors. Standard Chartered, a big funder of coal-fired power stations in Southeast Asia, is currently updating its position statement on coal. With the bank now poised to fund three proposed coal power projects in Vietnam, organisations including Market Forces are asking it to drop these plans and rule out backing any future dirty coal plants. “This ad sent a message Standard Chartered can’t ignore. We’ll keep the pressure on the bank to lead the way and be the clean energy leader South East Asia and the world needs,” said Julien Vincent, executive director of Market Forces. 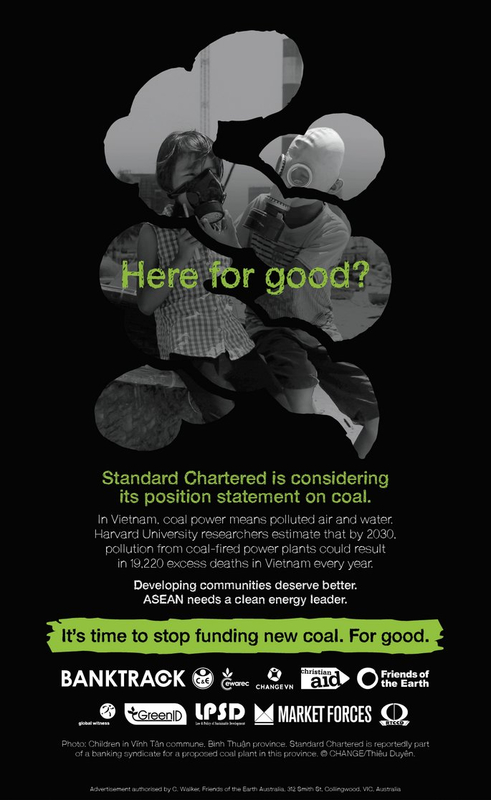 Send an email urging Standard Chartered to stop lending money to new coal now!